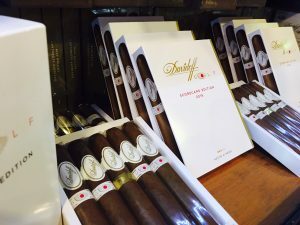 Davidoff cigars are known for their exceptional quality and flavor and the Golf is no exception. These limited cigars are draped in a gorgeous Ecuadorian Connecticut wrapper and deliver smooth notes of cedar and butter. These are one of the finest cigars you will ever smoke. We are currently offering these masterpieces for $21.95 for singles and $93.95 for a five pack. Come by and get yours today! This entry was posted in Cigars, The Dani Blog. Bookmark the permalink.